The retailer came up with the idea after recognising potential weaknesses in paper based traceability systems following the pigmeat dioxin crisis. Martin Kelleher MD of SuperValu and Ronan Loftus of IdentiGEN Ireland. SUPERVALU IS TO become the first retailer in Ireland to adopt a national DNA trace-back programme for its bacon to ensure it’s Irish. The retailer came up with the idea after recognising weaknesses in the paper based traceability systems following the pigmeat dioxin crisis. The Irish Farmers Association partnered with IdentiGEN to build the world’s first national DNA databank of boars, to prevent co-mingling of Irish and non-Irish pork. SuperValu says they will use this system on all its rashers, ham and bacon, both prepack and over the counter. The program will also form part of the Bord Bia quality assurance program, with both Bord Bia and IFA collecting and testing samples from SuperValu products on a monthly basis to ensure compliance with country of origin labeling. “The idea behind this system is to increase the sales of Irish product in the domestic and export markets by providing the consumer with a cast-iron guarantee, backed by science, that the product is of Irish origin,” said chairman of the IFA national pigs and pigmeat committee, Pat O’Flaherty. Last year, SuperValu’s sales included €182 million worth of Irish meat and poultry – the equivalent of 78,000 cattle, 130,000 lambs, 12.1 million chickens and 191,000 pigs. SuperValu serves over 2,000,000 customers every week and has 198 stores nationwide. 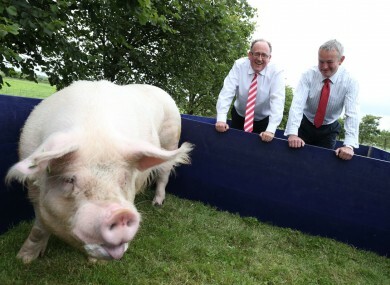 Email “SuperValu to become first retailer to trace its bacon by DNA”. Feedback on “SuperValu to become first retailer to trace its bacon by DNA”.